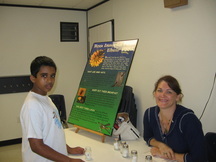 the free programs and curriculum available from their Environmental Educators. Vicki Culbreth, Roswell Schools, 770-641-3742. Teresa Stickels, Milton Schools, 678-242-2509. Terry Porter, Alpharetta Schools, 678-297-6213. Carla Bahun, Johns Creek Schools, 770-551-7766. Sharon Smith, Sandy Springs Schools, 404-612-8006. 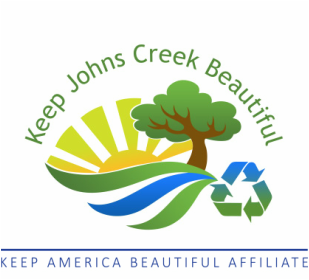 We provide environmental programs, recycling center tours, community service projects, and more for Johns Creek Schools free of charge! Keep Roswell Beautiful has "The Earth Balloon", a 22 ft tall and 22 ft wide inflatable classroom that allows a class of 25 students to experience the Earth in a thrilling new way. The Earth Balloon is made up of satellite images of the Earth and can be used to teach water conservation, habitats, geography, math, time zones, animal and human migrations, map projections, climates, human impact, etc. As a mobile classroom, the Earth Balloon has found an especially important role in Environmental Education as more and more schools are unable to take fieldtrips. The possibilities are endless. The Earth balloon is free for schools in Roswell. It can be leased to other schools in the area. A native of Sandy Springs, Jerry has been a park ranger at the Chattahoochee National Recreation Area for 34 years. This river was his childhood playground and he knows it intimately. As a young person he witnessed places that he held near and dear suddenly disappear and realized that environmental education was the only way humankind could awaken to their privileged role as stewards of the planet. He also realized that it was in these disappearing places that he learned more than he ever had inside a traditional classroom, and he then began to dedicate everything he was doing to their preservation through education. According to Jerry, environmental literacy is important because: we have increasingly major challenges facing us and we have to acknowledge the ecosystem services that clean our air, water, and soil, and provide us with a healthy space to grow. Jerry Hightower can be found at the Island Ford unit of the Chattahoochee National Recreation Area leading hikes and canoe trips. K: Fur, Feathers, and Scales. 1st: Plant & Animal Characteristics. 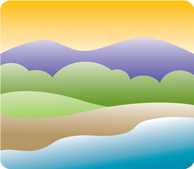 2nd: Grow & Change, Life Cycles, Native Americans, Georgia's Regions & Rivers. 3rd: Georgia Geography; habitats, minerals, and fossils. 4th: Water Power: mills & water wheels. 5th: Micro, Macro, and Beyond; Scientific Classifications of plants and animals of the Chattahoochee River and Microorganisms good & bad. The Dr. Robert E. "Bob" Fulton Environmental Education Center (Bob Fulton Center) is a key component of the Johns Creek Environmental Campus. The center allows for the wastewater treatment process to be used as an educational tool. This facility includes a lecture hall, classroom and teaching lab which are used to educate visitors on the issues and benefits related to water treatment, quality and aquatic life in the Chattahoochee River, as well as water conservation, reuse water, the value of water and other environmental issues. Tours are free of charge and they must be scheduled and confirmed by completing the Group Tour Registration Form and contacting the Bob Fulton Center at (404) 613.3001 or (404) 613.3012 or via email at JCEC@VeoliaWaterna.com. JCEC can also bring some of the tours to your school. Call Debra Ewing, Program Manager of Dr. Robert E. "Bob" Fulton Environmental Education Center, for more information. For more information on visitor's activities click here to see the flyer. EE in Georgia provides lesson plans that were created in partnership with the Georgia Department of Education and are also published on the Georgia Standards Online (GSO) Web site. Help students learn about habitat conservation! Our Shared Forests (OSF) is Ecuador and Georgia's Migratory Bird Partnership through Integrated Conservation, Bird Monitoring and Environmental Education. In Ecuador, OSF targets science-based habitat conservation throughout the Choco Andean Corridor, one of the earth’s top five biodiversity hotspots. While, in both Ecuador and Georgia, it aims at creating awareness about 10 bird species that migrate between both regions. OSF is designed to be socially, environmentally and financially sustainable. It is a bi-national partnership between the Ecuadorian NGO Fundación Maquipucuna, the University of Georgia’s State Botanical Garden, and the Chocó Andes Alliance and APROCANE associations of farmers and landowners in Northwest Ecuador. Overall, this project is designed to bring light to the importance of conserving existing habitats and reestablishing fragmented habitats of neotropical migrant birds. Neotropical migrants are birds that spend their winters in North America and their summers in Central and South America. Habitats of these birds are becoming fragmented as trees are cut down for timber, development and agriculture. Available through The Stone Mountain Educational Center and the Chattahoochee Nature Center. Click here for more info. Since 2004, The Clean Air Campaign has helped over 750 schools in Georgia create safer and healthier campuses and develop engaged learners. Our free, turnkey programs offer elementary, middle and high schools action-based learning projects to reduce air pollution and traffic and educate students on sustainability, air quality and transportation. KGB Educator Kit provides information about the programs and resources that Keep Georgia Beautiful, Keep America Beautiful and some of our partners have available to assist teachers and non-formal educators. To receive a hard copy of the Educator Kit, which in addition to the information available online comes with educational posters for your classroom, contact Sarah Visser at (404) 679-4910 or sarah.visser@kgbf.org. "Buster" is available to bring for school assemblies and large gatherings through Keep Georgia Beautiful.